Dr Tijion Esho is an award-winning UK cosmetic doctor, renowned for his expertise in aesthetic medicine and an industry leader in the art of non-surgical procedures. The ESHO Clinic attracts a global clientele with patients from 50 countries. Dr Esho’s obsession with detail, his unrivaled precision and passion for creating only the most outstanding natural results has made him one of the most influential people in the aesthetics industry. Dr Esho will be conducting the following treatments at the Nova Clinic Dubai. As well as pioneering new techniques and methods in lip augmentation with the Nano Droplet technique and Cupid’s Bow Lift. He has spearheaded an industry wide trend for laser skin rejuvenation and is at the forefront of non-surgical corrective work. One of the most innovative cosmetic doctors of the past decade, Dr Esho inspires his peers to develop their skill with the Midas by Esho*. In 2016 he became the first cosmetic doctor ever to broadcast his clinic live via Spectacles and 2017 saw the launch of a sell-out ESHO product range. 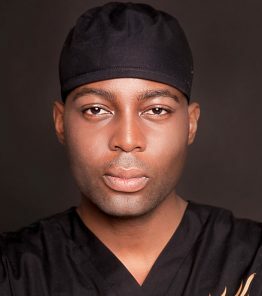 With a combined social following of more than 80,000 and Channel 4’s cosmetic doctor in residence [on E4’s hit show ‘Body Fixers’] Dr Esho’s client list spans some of the biggest names in fashion, film, beauty and even royalty from further afield. Dr Esho is passionate about addressing the lack of regulation in aesthetics and in 2016 he set up The ESHO Initiative in collaboration with Church Pharmacy and Cosmetronic. The philanthropic pursuit provides corrective treatment, free of charge, to patients who have been the victims of botched cosmetic procedures, those who have been born with congenital deformities and those who have experienced severe scarring or disfigurement, due to a life changing incident. In 2005 Dr Esho graduated, with the highest honours, from Leicester Medical School with a Bachelor of Medicine (MBCHB). Since then he has completed extensive advanced level medical training, completing MRCS to become a member of the Royal College of Surgeons (MRCS), and subsequently has a CCT in VTS becoming a member of the Royal College of General Practitioners. Founded in 2013, The ESHO Clinic provides clients with a luxury bespoke service tailored to their individual needs. With clinics in London and Newcastle and a brand new clinic opening in Dubai this year, Dr Esho’s team is made up of the aesthetic industry’s rising stars – all are GMC registered and trained to the highest standards. *The Midas by Esho is a revolutionary tool used to help sculpt and position lips during lip augmentation.